At Corolla, a ranger born and raised on North Carolina’s Outer Banks recalled the days of “little cedar-shake cottages” where you pushed out a shutter to open a window. YES! I remembered. From earliest memory, c. the late 1940s, my family vacationed in such cottages each summer on the OBX (an acronym then unknown). At night we heard the ocean through those windows. Hearing talk of “McMansions” (climate-controlled and perhaps equipped with white-sound recordings of waves?) popping up along the beach peninsula, my reverie turned to short walks from little cottages, between low dunes, to the sea at Nags Head. Then, among artifacts displayed from the age of hunt clubs at Duck and Corolla, our ranger held up an antique glass container for bottled water. Travelers were advised to bring water, back in the day. Yes again! Among the equipage for our OBX trips, my mother used to pack drinking water in bottles and thermoses. I mentioned that to the ranger and she said that was true all over the islands. The local water, we both recalled, was safe for bathing, even cooking, but discolored and nasty in taste and (PHEW!) scent. That was attributed to sulfur and trace elements. Husband Robin and I were spending a week early this March on the OBX. It is exciting to visit exotic sites for the first and perhaps only time, but there are different thrills in exploring some long-loved place, discovering its changes, continuity and surprises about the past. This time we joined a James Madison University Lifelong Learning Institute group of 20, mostly fellow-retirees, traveling six hours from our town near the Blue Ridge Mountains to stay at the Sea Ranch Hotel in Kill Devil Hills for a good blend of educational and entertainment activities along with ample free time. In my youth, and my few later trips, we’d always turned south toward Kill Devil Hills, Kitty Hawk, Nags Head or Hatteras after crossing the Currituck Sound bridge toward the seashore — never north to Corolla or nearby Duck, where, we now learned, wealthy city-dwellers had established hunt clubs, barring visitors and slaughtering much of the prized duck population which had seemed boundless. I wondered what happened to most of the long-dead ducks we viewed in slides, a dozen at once strapped from each proud hunter’s shoulders – how many wasted? Hunting is strictly regulated now. The Currituck Sound/ a.k.a. Wright Memorial Bridge is, and was, the main road from the mainland to the Banks’ long ocean-front peninsula (once an archipelago). As a child, I would get so impatient as we rode toward that bridge. The flat road (now US 158) would go on so long, through marshes and pine barrens, that it seemed we would never reach the sea. I found myself channeling the same impatience this time — especially since, never having encountered a toll booth there before, I had assumed the bridge would come immediately after our $3 was collected. Nope — about 30 more miles. The bridge has two spans now, but there is a plan under debate to build a much bigger one over the Sound. Wonder what the toll will cost. When I was young, in summer, I couldn’t wait for my first dive in the ocean. That’s not something to try in March unless you are a fugitive polar bear, or one of the wetsuit-clad surfers whom we watched. (That sport, seemingly unknown in the Carolinas at midcentury, does look like fun.) Whatever season, arriving at the sea still feels like a pilgrimage to me; I have to step in barefoot and splash my face. Walking to the beach in sunshine the next morning, we were greeted by a man who looked like a central-casting sea captain. He turned out to be singer-songwriter and onetime Coast Guardsman Bob Zentz, who led our group in sea chanteys and regaled us with nautical lore, while his wife, historian Jeanne McDougall Zentz, reported on the likelihood that the Kikotan tribe and English explorers played and heard each other’s music. No happy outcome, there. Kikotans were lured by a tabor (a drum usually accompanied by a pipe) to an English ship, then massacred, with survivors driven away. 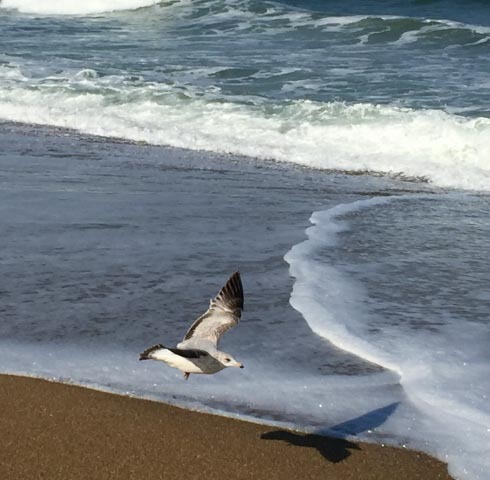 My favorite moments this trip came on walks along the beach. The ocean is always there, in the same rhythms but varying by colors and turbulence. Off-season is best for beachcombing. I found small, colorful striped shells– some mustard-hued, others sharply black, white, gray — and many of the intact, tiny bivalves that were my favorites in childhood. I’ve never been able to catch flying birds in a camera lens according to plan, but got lucky a few times when gulls happened to take off or descend in front of me. Once while the tide came in, a wave caught us and soaked our shoes. A sense of a short span of eternity: In a moment of mischief when I was four (or five? six? ), I threw my father’s shirt in the sea while he went for a swim. We never found it. I imagine the fabric totally dissolved decades since, while its broken pieces of buttons have been worn to tiny, smooth bits among the billions of pebbles that swirl about between tide levels, pelting any swimmer who rides one of the stronger waves all the way to land. We climbed up to the entrance of a pier and discovered it was Avalon Pier: another childhood memory. The dim interior has old, faded carny games. Along the pier, where some anglers tried their luck, are fish-shaped plaques honoring departed fishermen. One is identified only as “Little Yankee B—–d.” I found that obnoxious, but my husband, a gentler and mellower soul who comes from the U.S. region whose people are called “Yankees,” found it amusing. Breakfasting each morning at our hotel’s ocean-view Bistro Café, we were served excessive amounts of pancakes by a cheerful waiter who hoped we would see dolphins. They never materialized – probably because it had turned too cold, he said later. One woman in our group saw a whale. Eateries liked to pile food on. At the Beach Bar and Grill, which features a shark décor, the waiter talked us into getting sundaes, each with three scoops! Fortunately we were able to take the uneaten part back to our room’s fridge-freezer compartment. One must-see restaurant, the Black Pelican, serves seafood and deli in a sprawling, one-time rescue and telegraph station at Kill Devil Hills used by the Wright Brothers to send out news of their flight on that 4-degree Fahrenheit day in December 1903. Hurricane ravages run through the Banks’ history. They’ve forced that building to relocate three times, but its weathered walls and engraved tin ceilings remain. 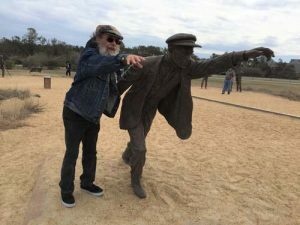 Although we saw more woods than I remembered – predominantly loblolly pine and water oak (which, like live oak, has year-round foliage) — I had not been aware that the Outer Banks, from the Kikotans to beyond the Wright Brothers, had virtually no vegetation. 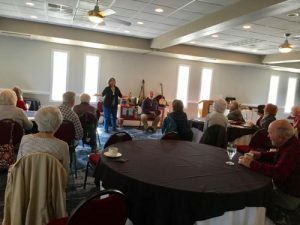 That was all imported, said Danny Couch, of Hatteras Tours, who gave our group a day’s bus tour from the hotel down to Ocracoke. Like our Corolla ranger, Danny’s roots are in the region and he shared a treasure trove of information. (Ex., “The odds of you being attacked by a shark are less than the odds of you being struck by lightning. 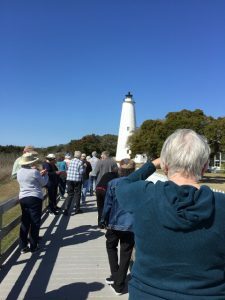 You are not its primary food source.”) Having seen the Currituck Beach lighthouse, we enjoyed stops at each of the other three along the oceanfront: Bodie Island, Hatteras (plus its original base, inscribed with keepers’ names), and Ocracoke. Danny recalled the Hatteras Lighthouse move of 1999. He was part of the group opposing that spectacular project, which he claims proved unnecessary. The lighthouses, like the long-running “Lost Colony” pageant, were not open yet. Tourists can climb them in summer. I’d ascended Hatteras not many years ago. They’re no longer needed for navigation, but the lights stay on. 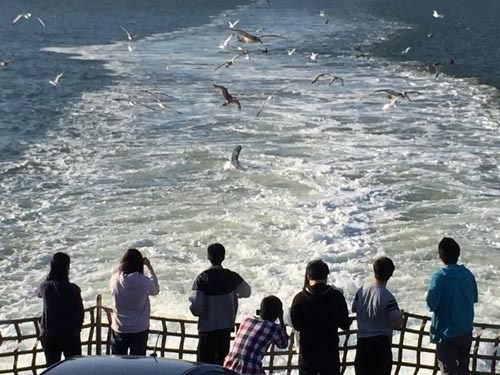 On the ferry returning to Hatteras, some world-touring young students fed gulls and pelicans. That’s against regulations, but no one tried to stop them. I remembered when it was legal: breaking bread slices into bites the right size for the birds that would follow our wake, deftly grasping morsels in mid-air. 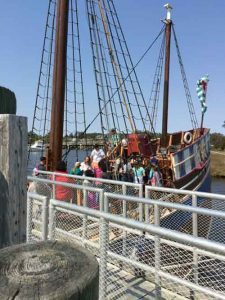 Another day, going inland to Roanoke Island Festival Park at Manteo, we toured the replica of 69-foot, 16th-Century Elizabeth II, which carried 50 sailors across the Atlantic. After an enthusiastic elementary-school class finished their visit, we were regaled by costumed sailor/guides cheerfully describing their missions of state-sanctioned piracy and grisly punishment methods such as the cat o’ nine tails. One young man, positioned below deck, said he appreciated his job of emptying slop pails because it provided his only moments of fresh air. The dark humor reminded me of Tower of London tours, bringing history to life in a way that the more dry and sanitized version my generation received could not. The park also included demonstrations of crafts such as metalwork. 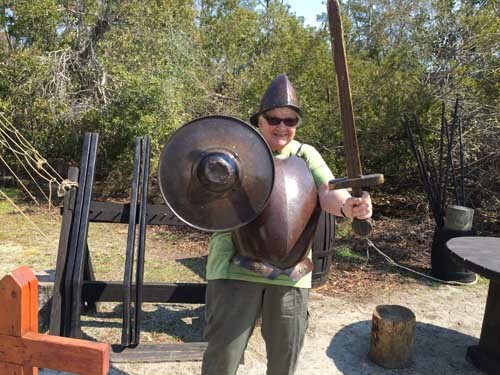 Tourists could try on a suit of armor (unflattering, but flattery was evidently not its goal). The morning before heading home we made a 1 ½-mile side-trip to the Wright Brothers Memorial. Our tour itinerary did not include it, but neither of us had been there in many years. The visitors’ center is closed for renovation, yet we explored the essentials: markers where the plane took off and landed that December day, a replica of the inventors’ quarters, bronzed representations of Wilbur, Orville and their plane, and the big dune they had used for glider flights to test wind currents before cranking up the historic machine’s propeller. The Art Deco-style memorial sits atop the 90-foot dune, which I climbed for the first time (thanks to its now-easy path). It affords a panoramic view of a landscape that storms as well as developers are continuously changing. There are credible predictions that the entire peninsula will wash away before the next century. It was good to have this uncrowded, un-sunburned, reflective look.